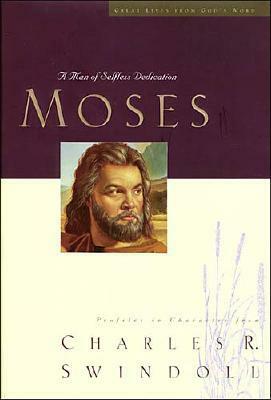 Moving right along in Swindoll's Great Lives series, this month I read Moses : A Man of Selfless Dedication. Just to recap where I've been with this series (in case you are new around these parts), I'm reading through these books over the course of this year. 3. God will work in ways that may be painful, but He will teach me to live in the pain, through the pain and beyond it and can work in me a tender heart as a result of it (Joseph ). 4. God honors faithful obedience. I was reading another book recently which mentioned Moses in a way that rankled me. This other author said that Moses was a broken man because he was an adopted child (of the Pharoah's daughter). This author made a claim that when God met Moses at the burning bush and told him to go and deliver the "Let My People Go" message, Moses found himself ill-qualified because of insecurities he felt as a result of being adopted. Even when I read this I had to reject such a statement of belief. In truth, the claims made me angry because I find nothing in scripture that says, "Moses was adopted and therefore he felt himself useless and insecure all of this life." His life certainly does not reflect that internal belief! Anyone who has a face-to-face relationship with the Almighty has a thing or two going for them, I'd say! "I am slow of tongue." To say that another way, "I am not a very good public speaker. I feel sick at the thought of standing in front of other people to deliver messages." I wouldn't say that Moses 'didn't know who he was.' I would say that Moses learned who He was in Christ and went before Pharoah (with his brother Aaron) and grew in his faith as a result. Eventually, the man who was afraid of public speaking was doing a great deal of it - before hundreds of thousands of Israelites. I think that's the way God is. He takes us into situations we aren't sure of and grows us there. Before we know it, we're living out the "I'll nevers" that we said we wouldn't do. Furthermore, we'll find that God's strength and good favor will be given to those who obey Him. When I look through my notes, the point I am continuously drawn back to is the one I think I can argue the most ineffectively. But here goes anyway. Swindoll honed in on a lot of Moses' character traits when it came to leading the Israelites. He focused on Moses' strengths and weaknesses when it came to delivering God's messages to His people, his obedience in sharing leadership responsibilities, and he also took a good look at Moses's emotions in various stages of the wilderness pilgrimage. The point Swindoll proceeds to make is that a leader who tries to do it all - counsel every individual, attend every individual family party, "do lunch" with all of the men and attend every single church function will be worn down much faster. (See my review of Leaders Who Last for an extended argument for this point.) He recommends that leaders - and others who serve in great capacity - learn to deligate responsibilities. The main counsel that a pastor gives, according to Swindoll, should be an accurate counsel of the Word of God, given from the pulpit. Swindoll's opinion is that a minister of the Gospel who is preaching the true and undefiled Word of the Lord is giving the best counsel to his congregants that he possibly could. (Not to say that some individuals and families do not need additional counseling. That's not the point Swindoll is making at all.) "Merely" this - your pastor can't be expected to carry you through every single detail of your lives. You'll wear him out! Certainly there are times when a pastor in the home is a necessary (and much wanted!) thing - I'm not talking about those moments. I'm talking about the day-to-day things that we should be able to figure out on our own. We don't need to pick up the phone everytime we have a disagreement with our spouse, for example. I also think this makes a good point as to why the people of God should be about pursuing good theology for themselves. We should learn not to fall prey so quickly and easily to false doctrines but be able to live out our faith. This requires careful thought, study, and devotion to the Word of God in our own right. If the leader/minister/server is allowed to delegate, it makes their lives easier and more pleasant. I think this is true for just about any one who serves with some regularity and oversees large ministries. I know I've coordinated a lot of events and parties and the thing always goes so much more smoothly and is enjoyable for ME if I can delegate some of the responsibilities. (And I'm only working things out on a small scale!) If one person has to carry the whole load, it become more of a chore than a blessing. And I kind of think - however naively- that being able to lead and serve should be a blessing to those doing it. Is your pastor happy serving you? Is the leader in any group you are a part of happy to serve? (Husbands happy? Yowee!) And by happy I don't mean (and Swindoll doesn't mean) just a grinning fool who isn't being honest about life. I mean genuinely, deep down happy - rooted in Christ and has Christ bubbling out of them? Happiness runs deep. It isn't a surface level emotion. Happiness comes because you know pain, suffering, hardship -- and the grace and abundant mercy of God. We should care that our leaders - in whatever capacity they are serving - feel and know that. How can we "followers" make their journey a blessed one? Instead of being like the Children of Israel - always grumbling that things aren't going exactly our way - where we can compromise and smooth the road out a little for those on the journey with us? Questions I'm asking myself. Annnd I'm gonna stop right there. That's further than I meant to go, actually, but I'm going to leave it. As I've said at the end of each of these Great Lives books - there is so much to glean and learn and I have appreciated the journey. I heartily recommend them if you haven't picked them up yet. I agree with your reaction to the argument that Moses was insecure because he was adopted. It sounds like a very superficial way of approaching the man who had a face-to-face relationship with God! In the past I've felt bothered by Moses' outbursts of temper. Lately though, I've been understanding more about what a remarkable servant he was, and how many ways he went to bat for the Israelites. This sounds like an excellent, thought-provoking study! Carrie, thanks for getting me interested in these books by Swindoll. I ordered 'Joseph' and I found 'Esther' in my church library. I am definitely interested in all the books in this series!